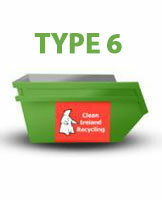 The “TYPE 6” standard skip from Clean Ireland Recycling offers great value for money for those medium size clear outs or building projects. With a capacity of up to a certified 6 ton and its extra rugged steel construction, it allows for the safe removal of heavier materials. Conventional skip trucks are limited as to where they can drop or pick up skips. 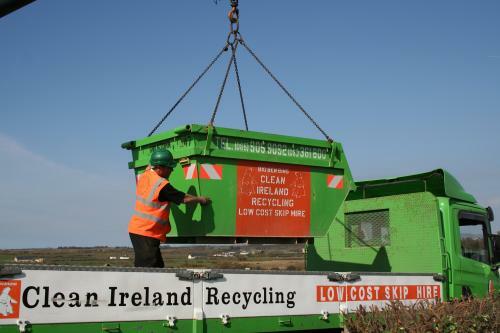 Clean Ireland Recycling uses specially designed trucks with long reach cranes offering much more flexibility to you the customer. Can be lifted from second storey of building site if required. Price includes Collection and Disposal.. If you would like a “TYPE 6” standard skip delivered to you, please complete the order form and we will deliver it to you. Most popular skip for Small to Medium size clear outs, DIY, Home or Commercial renovations, Medium size building projects, etc. Dimensions quoted are approximate external dimensions for reference purposes only.